A most attractive spacious detached Grade II Listed period cottage, built around 1640 before being extended in the 1980s with a two storey thatched annexe to the side and a single storey extension to the rear. The cottage is constructed of brick and flint elevations under a mainly thatched roof with secondary glazed windows and gas fired central heating with radiators. The property has a wealth of character and the current owners have lived there for some 32 years. They have carried out numerous improvements including total rethatching of the main cottage in 2016, a new boiler installed in 2015, fitting of a new bathroom and kitchen in 2016; an electrical inspection was carried out in 2014. The gardens are well stocked with numerous flowers and shrubs and the owners have encouraged the bird life. The property benefits from having no onward chain. 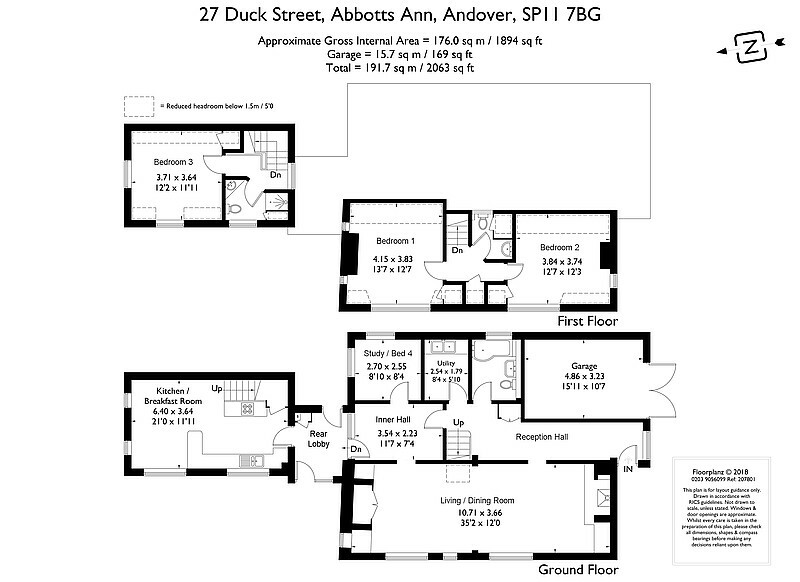 The property is situated within a Conservation Area in the heart of the village of Abbotts Ann. It has an award winning Post Office/Store owned and run by the village community, which also serves freshly brewed coffee. Other village amenities include a primary school, two public houses, an historic church, a nearby garden centre and benefits from Superfast Broadband. There is an active local community with numerous groups, activities and events catering for everyone from young families to retirees. The area is a haven for those who enjoy country walks with many footpaths leading into and through the surrounding open countryside. Many double as cycling tracks. Numerous sporting pursuits can be enjoyed nearby including horse racing at Newbury and Salisbury, motor racing at Thruxton, sailing on the Solent, and fishing on the celebrated River Test. The picturesque town of Stockbridge is about six miles away with its lovely riverside walks. Andover, approximately three miles away, offers a comprehensive range of shopping, leisure and educational facilities, as well as a mainline railway station providing fast services to Waterloo. The A303 is close by allowing convenient access to London via the M3 and to the West Country. The cathedral cities of Salisbury and Winchester are both within a half hour drive. LARGE RECEPTION HALL Secondary glazed window. Parquet flooring. Exposed framework to one wall. Built-in cloaks cupboard with shelves. Roof lantern. Staircase rising to first floor. Smoke alarm. Radiator. Beamed open entrance into sitting room. Latch doors to inner hall, utility room and bathroom. Dining area: Two secondary glazed windows to front aspect. Further secondary glazed window to side aspect with deep built-in cupboard. Second Inglenook fireplace, currently blocked off with timber double doors, beam over and display shelf. Exposed beams and timbers. Parquet flooring. Two spot lights and ceiling light. Radiator. Beamed open entrance into inner hall. INNER HALL Radiator. Latch doors to study/bedroom four. Small pane half glazed panelled door with small pane window to side leading to rear lobby. STUDY / BEDROOM FOUR Secondary glazed windows on two aspects with blinds. Telephone point. Radiator. UTILITY ROOM Twin bowl stainless steel sink unit with mixer tap. Deep tiled worktop with tiled splashback, pine cupboards over. Cupboard beneath with space for washing machine. Triple ceiling spot light. Shelving. Space for upright fridge/freezer. BATHROOM White suite comprising panelled bath with mixer tap/shower attachment and large shower head. Pedestal wash hand basin with mixer tap. Close coupled WC suite. Ceramic tiled walls and window sill. Secondary glazed window. Ceramic tiled floor. Extractor fan. Down lighting. Glass fronted medicine cabinet with inset lighting. Radiator. REAR LOBBY Secondary glazed small pane door with glazed side panel leading to front garden. Quarry tiled floor. Cupboard housing ‘Worcester’ gas fired boiler. Exposed brick and flint wall. Secondary glazed small pane door with side panel to rear garden. Radiator. Glazed panelled door leading to open plan kitchen/breakfast room. Breakfast Area: Exposed beams to ceiling. Secondary glazed window to front aspect. Two secondary glazed windows to side aspect. Two wall light points. Oak effect laminate flooring. Radiator. Second staircase rising to first floor. SPLIT LEVEL LANDING Smoke alarm. Latch doors to bedrooms one and two and cloakroom. Built-in shelved cupboard. BEDROOM ONE Small pane eyebrow window. Two secondary glazed windows to side aspect. Exposed timbers. Long shelf to one wall with spot light. Deep built-in wardrobe cupboard with shelving. Radiator. BEDROOM TWO Eyebrow window to front aspect. Secondary glazed window to side aspect. Built-in wardrobe cupboard. Radiator. CLOAKROOM Coloured suite comprising low level WC suite and pedestal wash hand basin with tiled splash back, pine mirror fronted cabinet over. Down lighting. Built-in shelved linen cupboard. Obscure secondary glazed window with blind. Wall mounted electric heater. LANDING Secondary glazed small pane window. Radiator. Latch doors leading to bedroom three and shower room. BEDROOM THREE Secondary glazed small pane windows on two aspects, one with distant views over the village. Built-in shelved cupboard. Radiator. SHOWER ROOM White suite comprising fully tiled shower cubicle with folding door, built-in cupboard to one side. Close coupled WC suite. Porcelain sink with tiled splash back, cupboard beneath and above. Vinyl flooring. Secondary glazed small pane obscure window. INTEGRAL GARAGE Brick and flint construction beneath a flat roof. Small pane part glazed double timber doors. Fluorescent strip light. Power points. Shelving. Work bench. Electricity meter. Outside tap. THE GARDENS A well stocked cottage garden surrounds the property. To one side, a broad, block-paved driveway leads to the garage and provides ample parking for up to three cars (We understand there is a right of access across the drive to the neighbouring property). A raised brick and flint wall runs alongside the driveway, retaining a mixed border with spring bulbs and an apple tree. The Front Garden is mainly laid to lawn with a mature lilac bush, a well stocked herbaceous border and climbing roses. Brick steps lead from the village road to a door into the rear lobby. The Side Garden is also mainly laid to lawn with stepping stones, flower and shrub borders and a mature apple tree. There is an outside tap, lights and a gas meter cupboard. The garden continues beyond a gated picket fence into a further enclosed area laid to lawn with well stocked borders. It includes a secluded block paved patio area, ideal for ‘al fresco’ dining screened by a trellis to one end with climbing roses. The Rear Garden Cedar wood greenhouse (part block construction with power, lighting and outside tap) and a timber garden shed/store. A raised area which has a gradual sloping bank features an attractive ornamental pond with a waterfall and rockery. Paved steps rise to the upper rear boundary where there are compost bins and a small apple tree. A block paved pathway at the rear of the cottage leads to a further secluded courtyard area with external power point and light. A timber gate leads from here to a pathway back to the garage and drive. Raised bank with a mature pear tree. All mains services connected. Note: No household services or appliances have been tested and no guarantees can be given by Evans & Partridge.